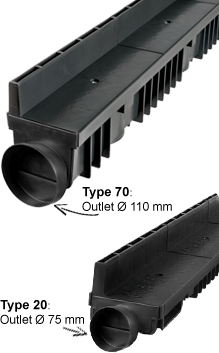 A slot drain ensures subtle drainage for your terrace or driveway. 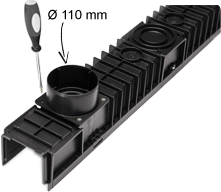 Prevent your terrace from flooding with this slot drain kit. Via the shallow slot the drainage channel drains all water through the entire gutter length, and so prevents puddles on or subsidence of your patio area. For easy angle installation of the drainage channels. by combining the gutter parts. 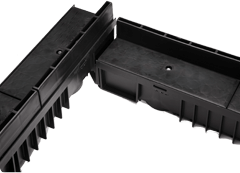 Choose between a shallow or deep drainage channel. Both are certified for load class B125 according to the EN-1433 standard. 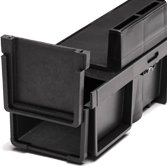 An all-in-one kit includes two stopends for closing off the drainage channel. For an easy connection to the sewer or gravel drain. For an easy connection to the sewer or gravel drain. The side outlet can also serve as stopend! Select below your all-in-one kit with the required total length. of drainage channel is possible as well. Do you require a total length of more than 12,00 m? Then add one all-in-one kit to your shopping cart, followed by one (or more) extension sets.